Back to Library » Finance » Opportunity Zones could be cities’ new best friends. Why? Opportunity Zones could be cities’ new best friends. Why? 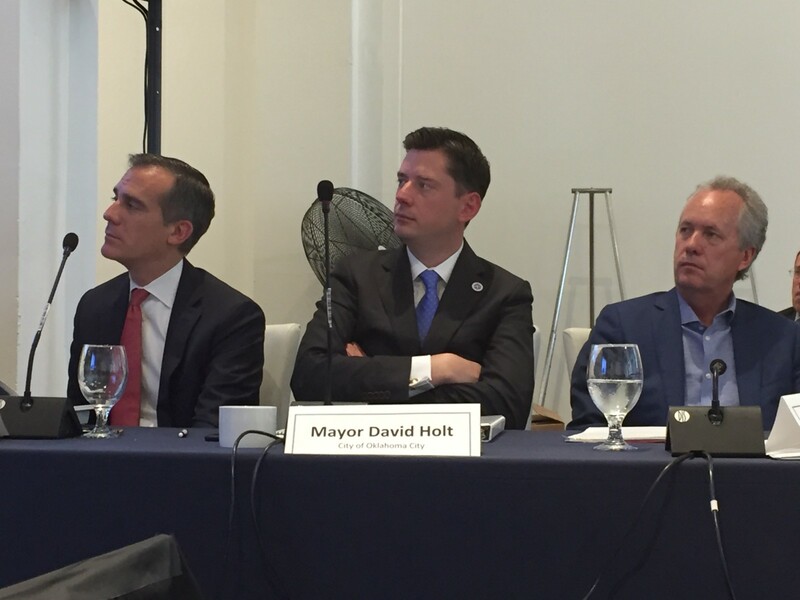 I recently headed up the coast to Los Angeles to spend the day with mayors from across the country, real estate developers, bankers and community leaders. Accelerator for America had brought this diverse group of people together to discuss something at the top of everyone’s minds. The topic? Opportunity Zones. Opportunity Zones were created by the Tax Cuts and Jobs Act of 2017. They create a tax incentive to push more dollars into the communities that need investment most. The basics of how it works: someone has capital gains, by reinvesting those gains into a pre-approved Opportunity Fund that someone will receive a temporary tax deferral and other tax benefits. These Opportunity Funds are required to invest 90% of its money in pre-approved census tracts — most of which are in rural or lower-income urban communities. Proponents have estimated that this could be a $6 trillion dollar opportunity for cities to leverage. As a result, communities could see real estate investors rehab old buildings to create tech incubators and more VC money for local startups. Those more hesitant to jump on-board warn that this recent policy isn’t much different than previous attempts to encourage economic development with tax incentives which failed to generate substantial economic growth. Cities need to act now and get positioned to leverage the $6T investment Opportunity Zones promise. Otherwise it’s uncertain that these investments can be channeled towards the projects communities need the most, as those project often have uncertain returns associated with them. Mayor Eric Garcetti (Los Angeles), Mayor David Holt (Oklahoma City), Mayor Greg Fischer (Lousiville) getting ready to share their thoughts on Mayor of South Bend, Pete Buttegig’s draft investment prospectus for South Bends’ Opportunity Zone. Love when cities learn from other cities! Some initial thoughts about how cities can start acting now to take advantage of Opportunity Zones are below. 8,700 specific census tracts have been defined as Opportunity Zones across the country, but implementation isn’t certain (the Treasury Department is still figuring out lots of deets!) But even with lots of uncertainty, 20+ funds have already launched, and there are more in the works. Cities that prepare now will be best positioned to receive funds, and do so in a way that is focused on their priorities, rather than the investors. Successful Opportunity Zone investments will align with city priorities and deliver on neighborhood needs. $6T is an excellent carrot and cities should use it as another reason to support meaningful engagement with their residents. Ideally, all Opportunity Zone projects stem from asking residents: what are the most significant problems in your day to day life? what can make your community better? There are tons of tools cities can use to make that process easier. (Checkout how Kansas City used a citizen survey to pass a $800M bond. Or how Purceville, VA used a polling platform to prioritize block-by-block investments.) These tools, used at scale, can be a great way to not only inform an investment prospectus but create a pipeline of projects that drive value to residents. The rise of the rest of the unicorns? There’s a lot of discussion about how Opportunity Zones could be the thing that finally moves venture capital money from its current comfortable home on the coasts. Don’t get me wrong, as a co-founder of a startup based in San Diego, I strongly believe that good ideas are everywhere and VC money should be more evenly spread across the country. But it’s important to remember that most startups that get venture funding have high margins(some operate at 90% margin!). To get there it often means companies have low capex (meaning they don’t build many things) and low opex (meaning they don’t hire many people). Venture-backed startups are not the most likely to create jobs for low-income residents in vulnerable communities, and they are not the most likely to stay in those communities after they get quickly acquired to payback their investors. The biggest job creators in communities tend to be existing business in those communities. When it comes to Opportunity Zones, those are the types of corporate investments that should be prioritized. To realize the value that many believe Opportunity Zones can create, investments need to go into the businesses, real estate projects, and community services that drive value for the most vulnerable residents. Investment dollars will find projects that make financial sense, its on city leaders to make sure those projects make community sense too. Want to read more on Opportunity Zones? Checkout these recent pieces in Route Fifty, Wall Street Journal and all this great stuff written by Bruce Katz and Jeremy Nowak. *Shortly after I drafted this piece, Jeremy Nowak passed away. His absence is felt by our entire community. My heart goes out to his family, friends and colleagues. Read more about his incredible life of service here. As projects become more expensive and budgets become tighter, cities are looking to innovative finance to help close the gap.